Cut Through the Clutter in San Francisco - Wylie Communications, Inc.
Read it and weep: More than half of all Americans have basic or below basic reading skills, according to the Department of Education’s latest adult literacy test. That means they can sign forms, compare ticket prices for two events and look up shows in a TV guide. But they have trouble finding places on a map, calculating the cost of office supplies from a catalog and comparing viewpoints in two editorials. How well are we reaching these folks with our messages? 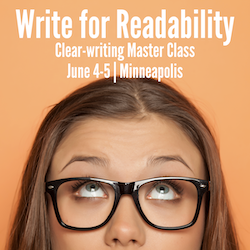 In this concise-writing workshop, you’ll learn how to make every piece you write easier to read and understand. You’ll walk away with secrets you can use to reach more readers, measurably improve readability and sell concise writing to management. Write for Readability: Reach readers, improve communication — even boost the bottom line — by making your messages more readable. Cut Through the Clutter: Measure, monitor and manage readability with a cool (free!) tool. Get a clutter-cutting workout with Wylie: Boost readability by up to 300% when you practice your new skills on your own work. Save up to $100 each when you bring your friends with our group discounts. 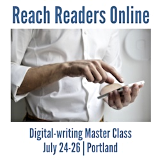 Then you’ll find out how to write easy-to-read messages that get more people to read your piece, read more of it, read it faster, understand it better and remember it longer. Write at a reading level that really reaches readers. Chances are, you’re vastly overestimating your audience members’ literacy rate, according to a massive international study. Plan your communications for special audience challenges. Older people, health care consumers, mobile users — maybe even your CEO — may need more help than you realize. Measure, monitor, manage and report readability — your No. 1 tool for making your messages more effective. Would your message be twice as good if it were half as long? The research says yes: The shorter your piece, the more likely readers are to read your message, understand it and make good decisions based on it. So how long is too long? What’s the right length for your piece? Your paragraphs? Your sentences? Your words? In this session, you’ll run your message through a cool (free!) tool to measure, monitor and manage readability. Stop discombobulating readers with long sentences. 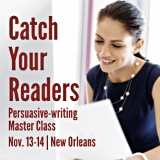 Leave this workshop with 11 metrics for reducing sentence length and increasing comprehension. Avoid causing your reader to skip your paragraphs. Find out how long is too long — and leave with three ways to shorten paragraphs. If your readers are like most, they have, on average, below basic numeracy, or numerical literacy, according a massive international literacy study. So how well are they understanding your quarterly results? Indeed, poorly handled, statistics can make your readers’ eyes glaze over. In this session, you’ll master the art of making numbers understandable as well as interesting. Indeed, jargon irritates your reader, makes your message less understandable, reduces your social media reach and influence, cuts your chances of media coverage, makes your website harder to find and demonstrates your lack of knowledge about the topic. It may even suggest that your company is in trouble. In this session, you’ll learn how to avoid these obstacles by translating the language of your organization into the language of your readers. — Kevin Trenga, manager, marketing communications, The Raymond Corp. Her workshops take her from Hollywood to Helsinki. There, she helps training clients at organizations like NASA, Nike and Nokia polish their skills and find new inspiration for their work. *Enter through this historic address. Guests who arrive at Battery Street will be asked to walk around the building to enter. Save $100 if you’re a Rev Up Readership member. (Join Rev Up Readership.) Save $100 if you’re a WCI member. by Sept. 16, to receive a full refund, minus a 20% handling fee. by Oct. 16, to receive a 75% refund. Sorry, no refunds after Oct. 16.